The Right Moment for Israel's Danny Danon? "Lunacy." That's how Danny Danon describes Prime Minister Binyamin Netanyahu's decision to hand over 104 killers to the Palestinian Authority as a "goodwill gesture." He's hardly alone, as many observers (including myself) are outraged by this move. But Danon, 42, has a unique place in this debate because he (1) sits in Israel's parliament as a member of Netanyahu's Likud Party, he (2) is chairman of Likud's powerful Central Committee, and he (3) serves as Israel's deputy minister of Defense. In American terms, his criticism resembles Gen. Stanley McChrystal's 2010 interview mocking Vice President Joe Biden. But McChrystal was gone within days whereas Danon continues to gain influence and stature. 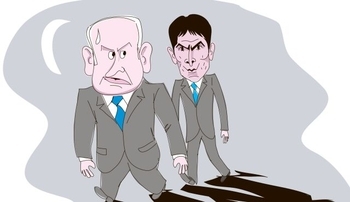 Danon (right) is widely seen as a thorn in Netanyahu's side, as in this Ha'aretz cartoon. Danon's ability to denounce his own prime minister's actions points to his not being a routine politician. Three qualities stand out: a devotion to principle, a mastery of tactics, and the ability to articulate a vision. Danon has remained true to the core principles of his party and his country. His righteous opposition when his party makes mistakes – such as the 2009 freeze on building residences for Jews on the West Bank or accepting the two-state solution – shows a strength of character. As he points out, "It's not easy being in a room of thirty people, alone saying no." His rise through Israel's national camp institutions reveals tactical skill: serving as assistant to Uzi Landau, as head of the World Betar Organization, then head of the World Likud Organization, as organizer of street protests and challenger to the prime minister for the party's leadership. These efforts culminated in his strong showing in his party's electoral list (coming in No. 5) and the jaw-dropping 85 percent of the vote he won in elections to lead Likud's Central Committee. With reason, the Forward newspaper calls him "a master of social and conventional media" and the Times of Israel deems him "a major stumbling block toward Palestinian statehood." 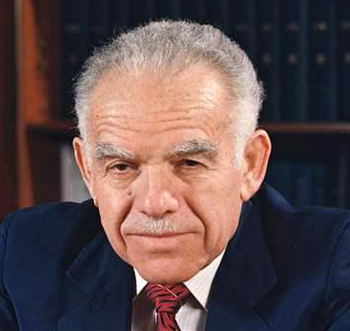 Yitzhak Shamir, Israel's last principled prime minister, left office in 1992. Finally, the vision: Its fullest articulation is found in his 2012 book, Israel: The Will to Prevail (Palgrave), where he sketches an ambitious and contrarian view of his country's foreign policy. Arguing that "history shows us Israel is often better off when she acts on her own behalf ... even if that means contravening the wishes of U.S. administrations," he concludes that the Jewish state "fares best when she makes decisions based on her own best interests." Jerusalem, he holds, should pursue its goals "with or without backing from her allies." This argument, commonplace enough for most states, is audacious in the case of small, beleaguered Israel. Danon's moment may have arrived. As Netanyahu appears to be making excessive and immoral concessions to the Palestinian Authority, Danon has emerged as a leading dissident ready to challenge his prime minister (remember "lunacy"). Should Netanyahu feel no longer welcome in his own party and leave it to found a new one (following exactly in Ariel Sharon's 2005 footsteps), Danon will be a potential candidate to lead Likud and win a subsequent election. One sign of his rise is the invective used against him. Justice Minister Tzipi Livni coined the term "Danonism" and demanded that Netanyahu reject it. Gideon Levy, an extreme left columnist for Ha'aretz newspaper, disdainfully but fearfully writes that "little Danny Danon will be big, the sugar of the Israeli right. ... [he] will go far." 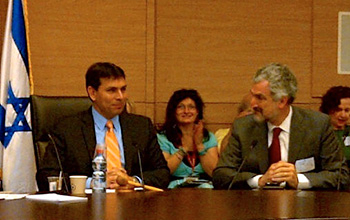 Daniel Pipes testifying before the Knesset's Immigration, Absorption and Diaspora Affairs Committee, chaired by Danny Danon, in March 2012. Looked at in historical perspective, since the taciturn but principled Yitzhak Shamir left the prime ministry in 1992, his six successors variously engaged in political betrayal, ethical corruption, and delusional egotism. Sharon (2001-06) abandoned his electoral mandate to the point that he had to flee his own party, even as his financial shenanigans had him in constant trouble with the law. Ehud Olmert (2006-09) had to resign due to a cloud of corruption charges. Focused on the Iranian threat, Netanyahu did well since 2009 but his recent offer of 104 murderers disturbingly contradicts the electoral platform of a half year ago. On a personal note, through the two decades since Shamir, I have constantly looked for someone with the character, energy, skills, and vision to lead Israel. I have known Danon since 2009 and have concluded that he has the necessary qualities. I hope and expect he stays true to his principles and rises to the point where he can end the recent desultory politics of the Jewish state and bring them in line with the country's many remarkable achievements. Much hangs in the balance. At a time when the Government of Israel and the IDF are in the midst of a military campaign against the terrorist organizations and is taking determined action to maintain the security of Israel's citizens, it cannot be that the Deputy Defense Minister will sharply attack the leadership of the country regarding the campaign. These sharp remarks on the Deputy Defense Minister's part are irresponsible, especially given his position. They also serve the Hamas terrorist organization as a tool to attack the government with as may be seen on the media networks of Hamas itself. In light of his remarks, which express a lack of confidence in the government and in the prime minister personally, it was expected that the Deputy Defense Minister would take responsibility for his actions and resign. Since he has not done so, I have decided – pursuant to the authority granted to me by Article 26(3) of Basic Law: The Government – to dismiss him from his post. The prime minister doesn't accept that there are other views in his party. Netanyahu has already ingratiated himself to Abu Mazen [Mahmoud Abbas] by releasing 78 terrorists just so he could sit at the negotiating table, didn't respond to the murder of the three youths Gil-ad Shaar, Naftali Fraenkel and Eyal Yifrach, and this morning agreed to a ceasefire that was very bad for Israel. What values will he surrender next time!? I did not agree, and won't agree, to this spirit of leftist feebleness by the prime minister, and I won't sell out my ideology for an office and a driver. Opinion polls released about the same time as these statements found support for both politicians. As the Jerusalem Post noted, "A poll broadcast on Channel 10 found that 73 percent of Israelis opposed the ceasefire. When a Channel 2 poll asked whether a ceasefire would bring about quiet, 92% of respondents said yes and six percent said no." May 15, 2015 update: Netanyahu has appointed Danon as Israel's 34th Minister of Science, Technology and Space and today he took office. Comment: It's a very impressive comeback by Danon, who hereby gets experience in his country's most dynamic sector. Aug. 14, 2015 update: Netanyahu has appointed Danon as Israel's ambassador to the United Nations, a high-profile position that will likely turn Danon into an international figure. The opposition has predictably twisted its knickers over the appointment, both accusing Netanyahu of doing anything to remove Danon from his Likud Party positions and seeing this as "another nail in the coffin of Israel's foreign relations." Predictions: (1) Facing the UN, Netanyahu and Danon will finally be on the same page. (2) Danon will use this as a platform eloquently to promote his country's interests and to promote his own eventual candidacy for prime minister. A star has been born.